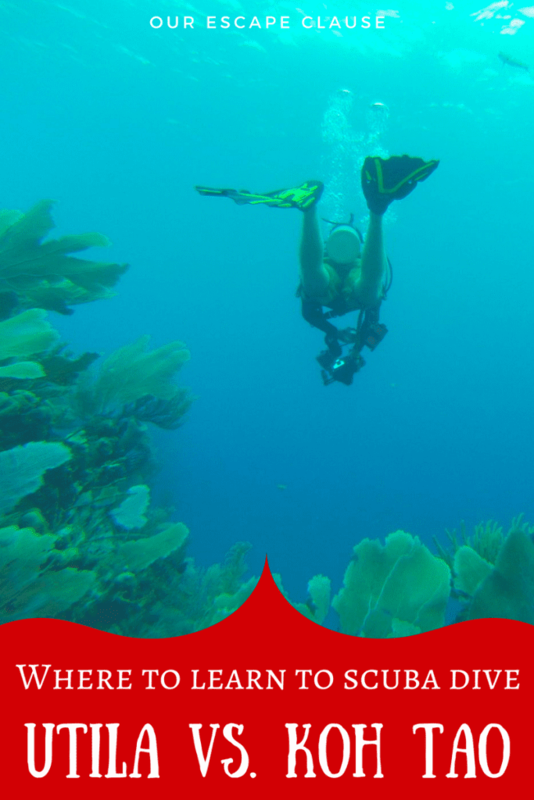 The best places to go scuba diving for beginners could be debated all day, but when you narrow the search down to the best and cheapest places to go diving, one thing is absolutely true: Koh Tao, Thailand and Utila, Honduras almost always make the list. 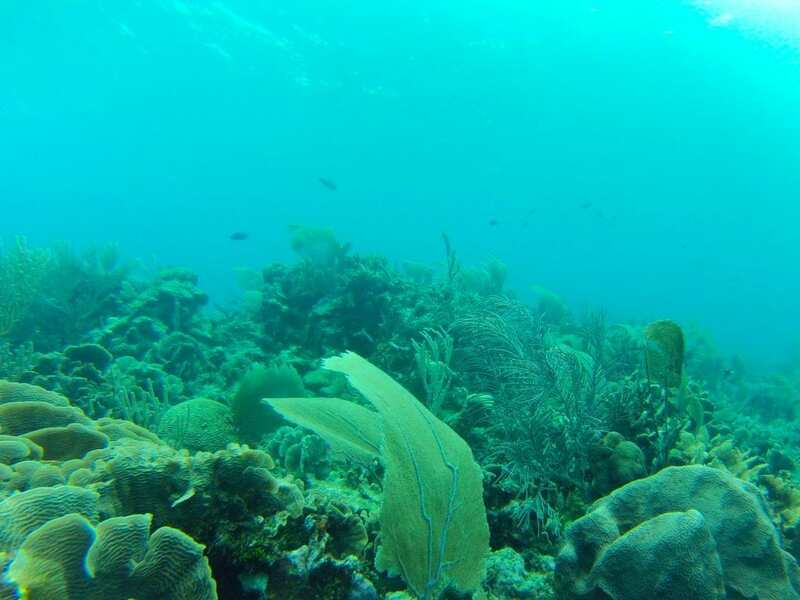 Both islands offer Open Water certifications at very low prices, both have a plethora of beginner-friendly dive sites, and both have plenty of dive shops to choose from. Jeremy and I have now experienced diving at both locations: we got our Open Water Certifications on Koh Tao in August 2016, and our Advanced Open Water certifications on Utila in March 2017. We loved both Koh Tao and Utila–but there’s no denying that both have their positives and negatives. Diving on Koh Tao is slightly cheaper. We paid a little under $240 USD/person for our Open Water certifications on Koh Tao. On Utila, the going price seemed to be a bit closer to $300. We found Fun Dives on Koh Tao to be about 30% cheaper than on Utila, even taking into account discounts garnered from doing fun dives with a shop that you also get a certification through. Like most popular dive destinations around the world, most shops will give discounts for being a dive master, buying multiple fun dives and/or a course, and supplying some or all of your own gear (like fins). Utila is easier to access. 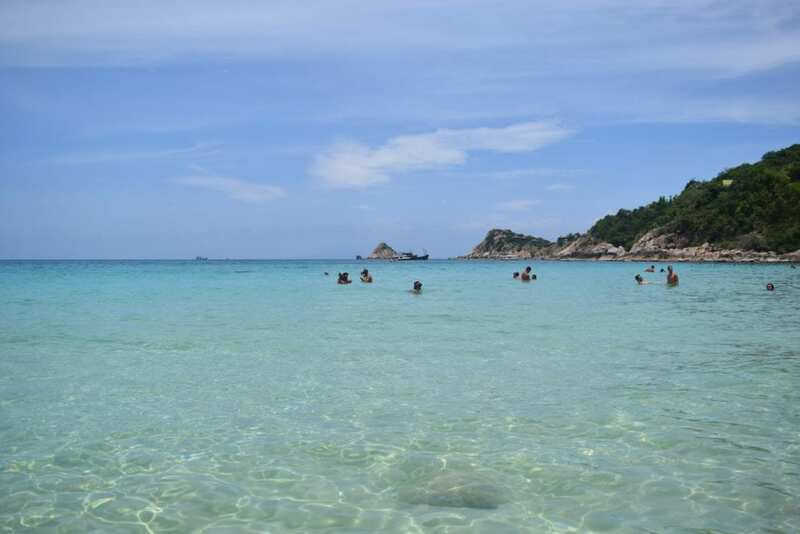 While both islands require a bit of a journey from a major airport in order to arrive on them, getting to Koh Tao is slightly more difficult than accessing Utila. Utila also has a (very small) airport of its own, so you technically can fly directly onto the island, though the convenience comes with a high price tag. Koh Tao has more dive shops to choose from. There are more than 40 dive shops to choose from on Koh Tao and about 15 on Utila. More choice means more competition to drive down prices and drive up quality, but it also means that it can be more overwhelming to choose a shop. Utila is a smaller community. While both Koh Tao and Utila are small islands, Utila is definitely the smaller of the two: the entire main town of Utila is made up of one long street. On Koh Tao, there are actually a few distinct villages (Sairee and Mae Head being the most well known), though they’re so small that I would be more likely to call them neighborhoods. Food is far cheaper on Koh Tao. When it comes to feeding yourself, Utila doesn’t have a lot of budget options–there are one or two food stalls with limited hours, but that’s about it as far as street food goes. On Koh Tao, the street food is dirt cheap and constant–chicken pad thai from the stall in front of 7/11 in Mae Head is still one of my favorite meals of all time. The nightlife is better on Utila. We can’t really speak to this personally, but it’s a commonly held belief that makes perfect sense to me: Utila definitely has more of a party atmosphere than Koh Tao. Check out this guide to Utila for more about exploring the island! The diving is better on Koh Tao. This is completely subjective, so I hesitate to put it on here, but the dive sites we saw on Koh Tao were more heavily populated with marine life and generally more interesting than on Utila–though for first-time scuba divers, both will be amazing. Utila has a hyperbaric chamber, and Koh Tao does not. 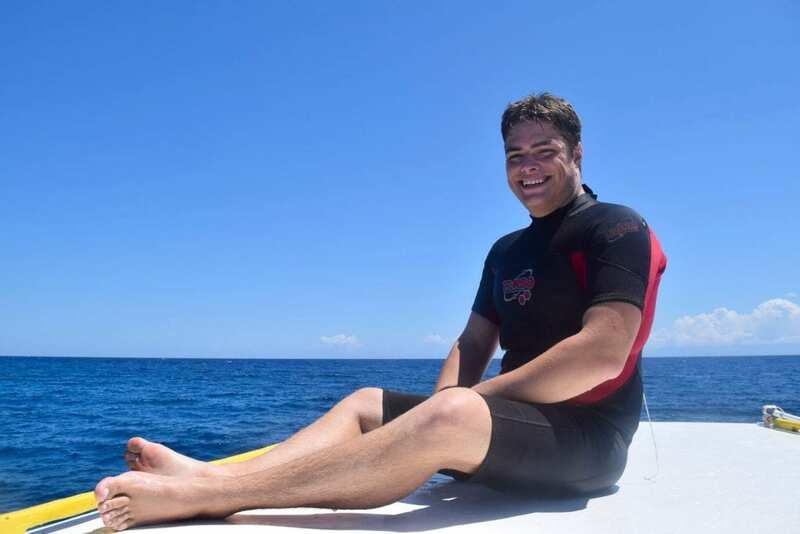 The odds of needing a hyperbaric chamber to treat decompression sickness are extremely small, especially as a cautious beginner diver who will not be going particularly deep–but just in case, Utila does have a hyperbaric chamber on the island. 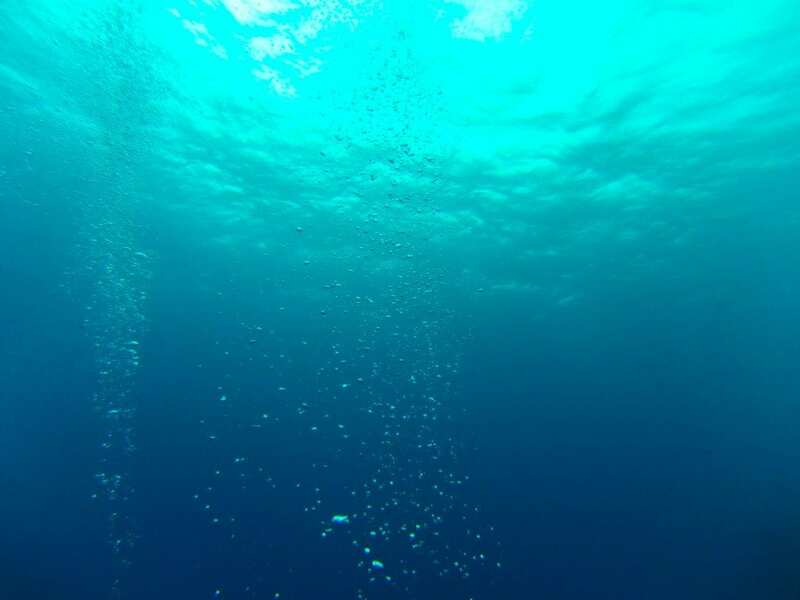 Koh Tao does not have a chamber–in the event of decompression sickness, you would be transported to Koh Samui for treatment. Overall, making a decision between Koh Tao and Utila as a beginner scuba diver will come down to preference and ease of access: truly, you can’t go wrong with either. Either way, be careful: both islands are home to plenty of expats who went to the island for a week and suddenly 10 years have passed. There’s a good chance that whether you’re in Thailand or Honduras, one of those expats will be the one teaching you how to scuba dive–or even running your dive shop–and they won’t hesitate to sell you on the beauty of their adopted home. Chez Milady — Milday runs a one-woman operation at her quiet guesthouse and apartments on Utila. We stayed in a small room with her, complete with A/C. The price and Milady’s kindness and generosity can’t be beat, though be prepared: electricity is not included in the price and can be pricey. Chez Milady is set in the jungle about a 15-minute walk from town, so be prepared for the occasional critter visitor as well. We would definitely head back to Milady’s if we go to Utila again. Nirvana Guesthouse — Located right in the heart of Mae Head, we loved this guesthouse! It was only a short walk from the pier, reasonably priced, clean, and the owner was very accommodating. We would be happy to stay here again–in fact, the only reason we moved guesthouses was because they were fully booked and we couldn’t extend our stay any further. Jom Thong Guesthouse — We didn’t move far: this guesthouse is just a five-minute walk from Nirvana Guesthouse. It is located even closer to the pier and the dive shop we were using. We walked to Sairee Beach in about 15 minutes from here. The room was slightly smaller, though just as clean, as Nirvana–but the real prize was the view of the water out the window. We wouldn’t hesitate to go back here, either! This is a great comparison and so helpful. Thanks! 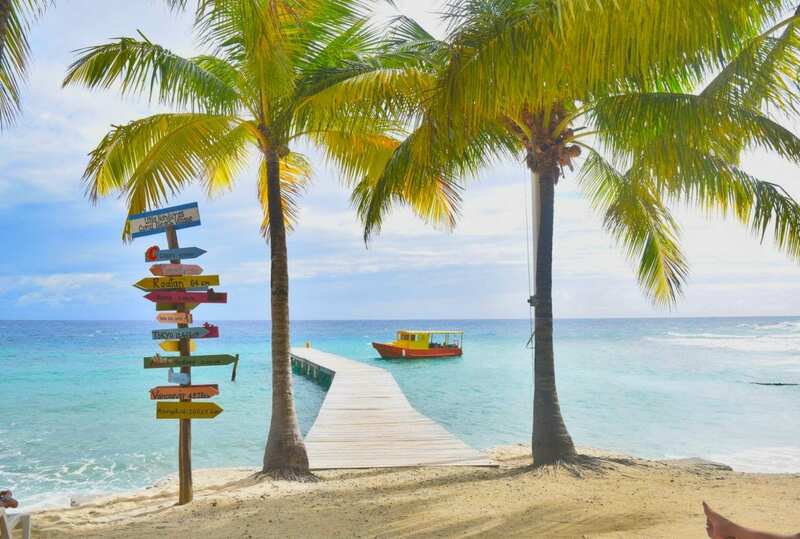 If not Utila, I’m guessing Roatan–it’s the next most popular diving destination in Honduras. I definitely think Thailand is a bit cheaper (though if your friend is getting you a discount, maybe not! ), but transportation costs can make a huge difference depending on where you’re coming from. I hope you enjoy your course! Diving is one of our favorite hobbies now. It is an amazing place! We dream about going back all the time.